After many days away from home, you arrive tired and with a lot of luggage to the cruise port of Barcelona. It was a special trip, a great experience. Now, just missing the shuttle connection to the airport or station, to get home and rest. Or, if you have time before your flight or before the cruise departure, you can also visit the most emblematic places of the city of Barcelona, leveraging the agility and speed of our taxis. Make your taxi reservation now for any transfer from and to the cruise port. Book Now! - Terminal name is also mandatory for "Allure of the Seas". Allure of the Seas is a very large cruise that uses 2 different terminals for disembarking at the same time. We also need the terminal assigned to you (A, B, C or D) to avoid any issue on meeting. If you don't know the terminal at the moment, please send us an email as soon as confirmed. BookTaxiBcn, your local expert in Cruise Port Transfers! Cruise Terminal is located at the foot of La Rambla (Barcelona's most famous Boulevard, also often referred to as Las Ramblas) which runs through the heart of the city centre. 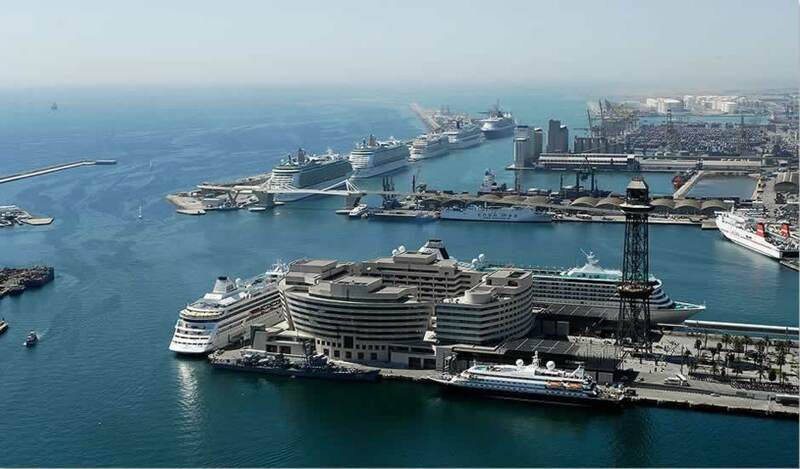 There are 9 terminals in total at the Barcelona port, 7 of these are cruise terminals. They can be roughly categorized into 3 main locations. Terminals A, B, C and D are based at the Adossat Quay and are furthest away from the city centre. The Terminal D is also called Palacruceros. There are 3 terminals at the World Trade Centre (WTC) pier which are called North, South and East terminals. Sant Bertrand Terminal, is also near to the WTC (refer to our cruise terminal map) This terminal is generally used for ferries between Barcelona and the Balearic Islands. There is one small terminal at the Maremagnum Port Vell however this terminal is mainly used for large ships and not cruise liners. If you are booking a transfer from or to Cruise Port, please indicate in booking for the name of the cruiser, to facilitate your pickup. Your driver will be waiting for you directly at cruise dock. We provide private transfers from Barcelona Airport to Cruise Port. From individual transfers to groups transfers with taxis, minivans, minibuses and buses. Book in advance and save!